One of the advantages of Office 365 over the traditional Office suite is that subscribers always get to use the newest version of Office. In addition to Office applications, all editions offer at least 1 TB of free OneDrive storage space. 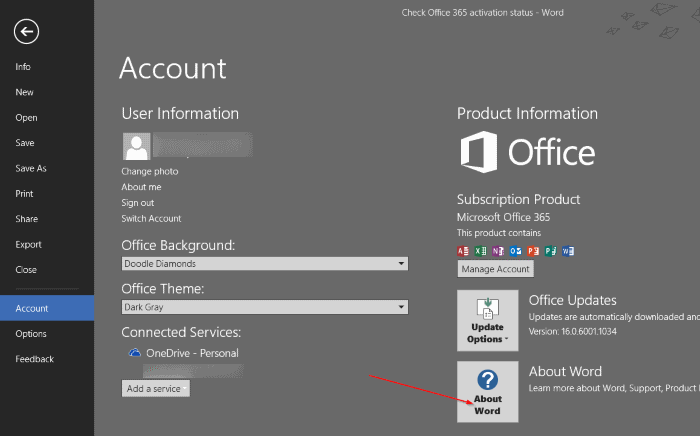 Installing and activating Office 365 or Office 2106 suite is fairly easy. But after installing and activating Office 365 of Office 2016 on your Windows PC, you might want to check the activation status of Office install just to make sure that you’re running a licensed copy of Office 365/2016 on your PC. In order to check the activation status of your Office 365/2016 install, you need to execute two small commands in Command Prompt. complete the given below directions to know the activation status of Microsoft Office 2016/365 on Windows. 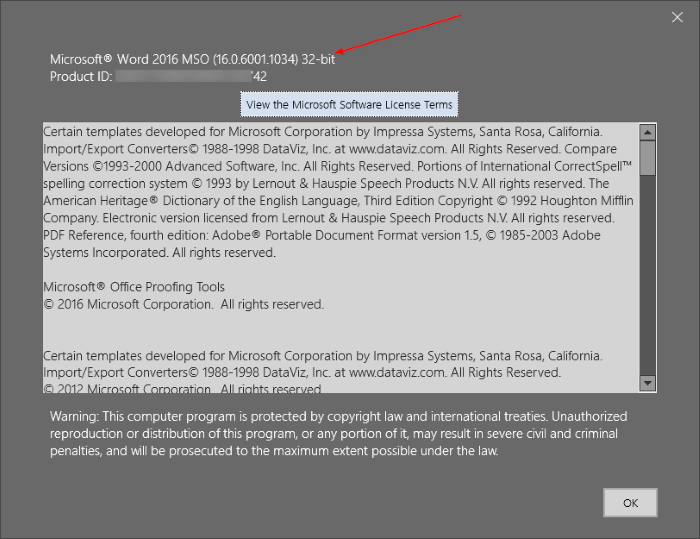 Step 1: The first step is to check the type of your Office 2016 or Office 365 installation. 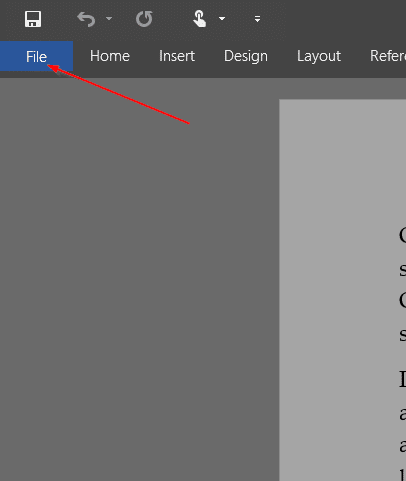 To do so, open Word, Excel or any other Office application, click File menu, click Account, and then click About Word to check if your Office 2016 or Office 365 install is 32-bit or 64-bit. 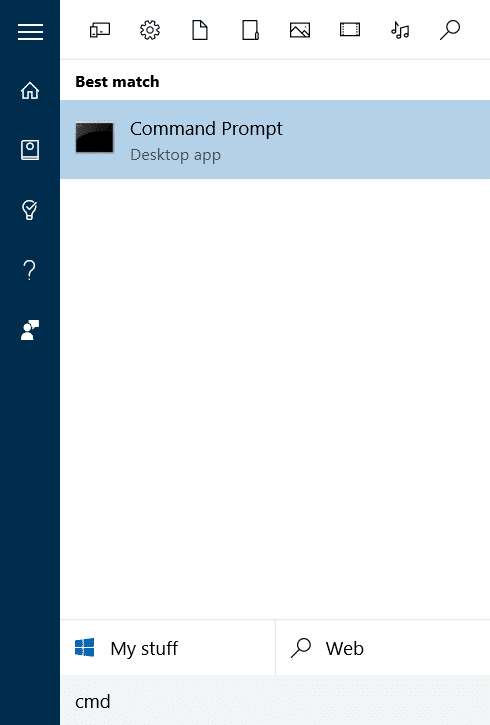 Step 2: Open Command Prompt by typing CMD in Start menu or taskbar search box and then pressing Enter key. Step 3: In the Command Prompt, type the following command and press Enter key. If Office 32-bit is installed on 64-bit Windows, please type the following command and then press Enter key. If Office 32-bit is installed on 32-bit Windows, please execute the following command. If Office 64-bit is installed on 64-bit Windows, type the following key and then press Enter key. In the above command, please replace “C” with the drive letter of the drive where Windows is installed. Important: If you’re still using Office 2013 as part of Office 365 subscription, replace Office16 in above commands with Office15. Likewise, if you’re using Office 2013, please use Office15 in place of Office16 in above commands. 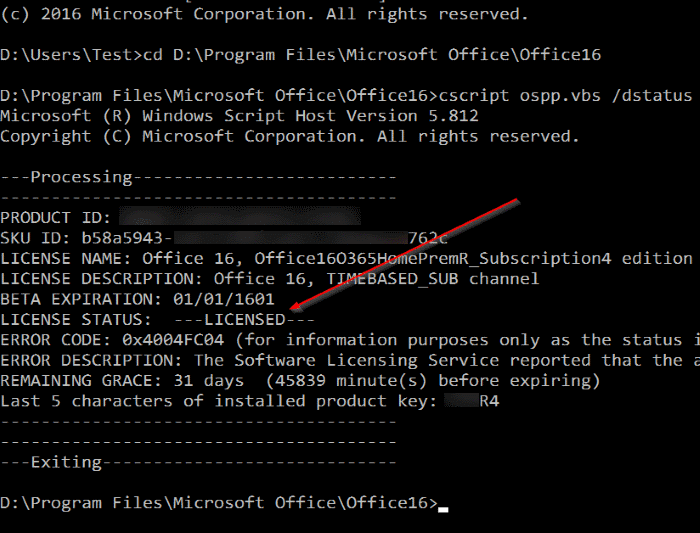 Step 4: Finally, type the following command to view the status of your Office 365 activation. As you can see in the picture below, if the copy is activated, you will see Licensed next to License Status. And if you want to check the expiry date of your subscription, please refer to our how to check Office 365 subscription expiry date guide. I have deactivated Office 365, however, when I open Excel or Word they still open as 365. I am taking an Excel 2016 class and need to reactivate my 2016 products. Can anyone help me with this? I am using office 2007 and seller told me that this key is valid for lifetime. So how do I check that my product key is valid for lifetime or not. What to do when license expires? how to renew your license? Hey there I had followed your steps but in my liscence satus its showing NOTIFICATION . Dear Into Windows – For our Office 365 Home (64-bit), I have exactly the same results lines as you show above (except no line for Beta Expiration). My Licensed Status is also “Licensed”. But then I see the same Error Code and Error Description and Remaining Grace as what you have. My Remaining Grace is 58 days, but my subscription should last for the next 9½ months. Am I OK, or will I wrongly start getting expiration messages in only 58 days? FYI – I am the second user of the five possible users for our Office 365 Home. My wife is the #1 user. Make a difference? Thanks.